It can be seen that many different transformer designs will be required to meet the requirements of even a very simple system. No voltage regulating windings, because the voltage is regulated by the field of the generator. Fairly uniform load - the new units of high efficiency in particular are kept loaded to maximum capacity. Least need for high efficiency or quiet operation - power for losses is cheapest at a generator station, and other equipment makes more noise than the transformer. Construction can be such as to require the type of supervision and maintenance available in a generating station. b- Substation Transformer (subtransmission circuits), Fig. 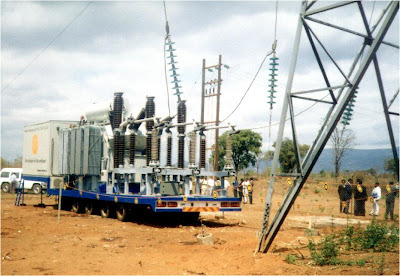 2 : At the end of the transmission line, the voltage is reduced to the subtransmission level by substation transformers. The transformer for this application are usually quite different from the generator transformers. Taps or voltage regulating windings are often required. The loads vary over wide limits in a daily and yearly cycle. Losses are more expensive because the transformers are located at a greater distance from the generator. Less maintenance and supervision is available. c- Substation Transformers (Primary Feeder circuits) : These transformers are used reduce the voltage from the subtransmission level to the primary-feeder level. 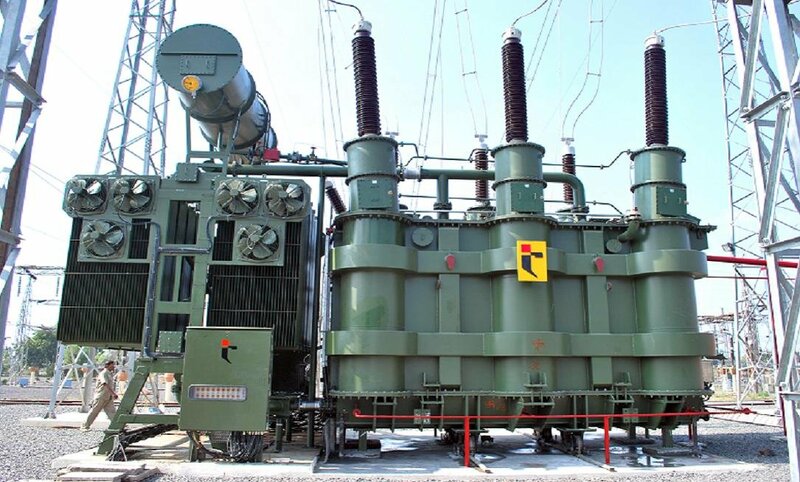 The requirements of this type of transformer are similar to those for the subtransmission substation transformers, but there are some differences which must be considered. The load varies over wider limits. The losses are more still more expensive. Substations are sometimes located in remote areas, which result in less supervision and maintenance. Quiet operation is more important because substations are often located near residences. d- Typical substations installations. The typical installation shown in Fig. 3 is used in areas where overhead lines are not objectionable, appearance is not too important, and where space is not too expensive. In residential sections where appearance is important and real-estate values make a compact design desirable, the single circuit unit substation showing of transformer and switchgear Fig. 4 can be used. As these units are located where the voltage variation is great, load tap-changing equipment may be necessary, with no-load tap changers for preliminary adjustment of voltage range. Current and potential transformers are provided for metering and control power to the circuit breaker, tap changer, air blast fans, and control circuits is usually supplied by auxiliary transformers. Lighting arresters, thermal relays, fuses in current and potential transformer circuits, relief devices, oil gauge, and preservation equipment can be built in into make the whole unit self protecting. Another type of unit substation. 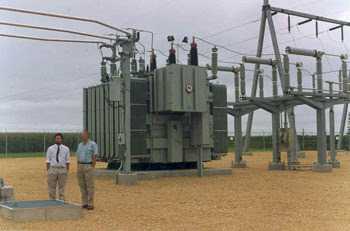 This substation consists of the transformer with its protective equipment and tap changing equipment, the transformer is connected to the associated switchgear through a "throat" built on one side of the case. The mobile substation shown in Fig. 5 is used to supply emergency power when a substation or part of a substation is out of service. The transformer, high voltage disconnect switch, low voltage circuit breaker, auxiliary transformer, and associated protective equipment are mounted on a trailer which can be towed quickly to the location where emergency service is required. The windings of a mobile substation are usually arranged so that they can be connected to obtain several different voltage combinations. Series parallel switches and no load tap changer are provided so that winding combination can be changed quickly and easily, permitting one mobile substation to be used at any several voltages. e- Distribution Transformer. 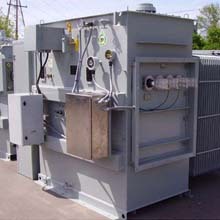 These transformers step the voltage down from the primary feeder level to utilization level. Into this classification fall the greatest variety of transformer because many different arrangements are required. Only the most common types will be discussed. The service requirements of distribution transformers are most exacting and difficult. The load varies widely and often in a most speculative manner. The transformer is often overloaded. Very little supervision is possible. Transformer must operate with a minimum of maintenance. The cost of supplying the losses is at its highest. Even the cost of supplying reactive volt-amperes may be appreciable. A low exciting (no load) current is desirable. Voltage regulation is important. Taps in the primary winding are often provided which are connected, before the transformer is installed, for the primary voltage which is expected to exist on the system at the point at which it is to operate, but voltage regulation is more commonly accomplished by separate voltage regulation equipment. Transmission and regulating circuits can be designed to avoid excessive voltage, but this is often impractical in distribution circuits. The transformers are sometime subjected to mechanical abuse. Since there are many of them on a system, the y must be constructed so that the cost of installation and replacement is low.